What does the factory heat exchange look like? I have just finished making one for the jk. There are similar oil coolers used on other engines. I found one at an engine reconditioner that was slightly larger & & had a 90deg bend in one of the water pipes. On the XJ the pipes appear to corrode in time if water without inhibitor is used. The outside of the cooler is made of some sort of metal that doesn't solder well. Replacing the cooler is one of the worst jobs when the engine is in place. The clamps on the hoses are a PITA, the main bolt is hard to start & the Orings like to fall out of place. The water cooled setup fed by the cooling system with 2 pipes inlet and outlet that attach behind the water pump housing ... I'm wanting to block it off behind the water pump and fab up an aftermarket oil cooler as these little pipes have failed me twice, once in my 98 and also in my 97. Both times were on trips .. happened at the end of the creb track and on a trip through steep ranges both I assume that the oil temps would have been high. As you know these pipes also are situated under the exhaust manifold where extremely hot temps would occur... 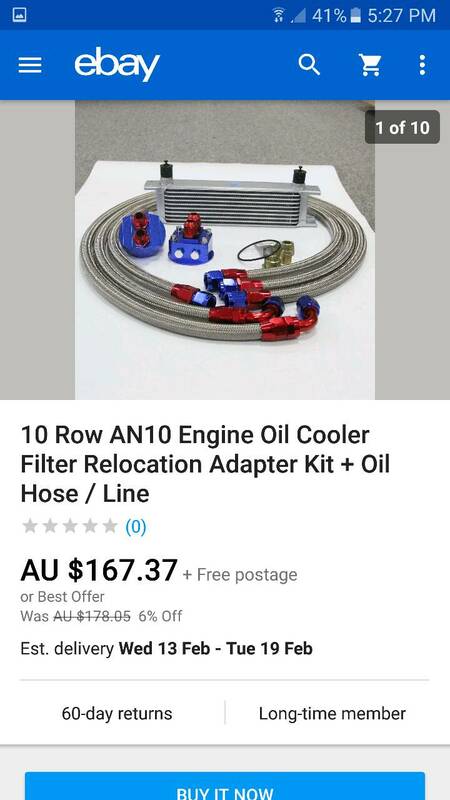 I am looking at something similar to the picture to cool the oil like a transmission cooler and eliminate the water fed system all together. Any thoughts or advice if someone else has already done ?? The oil cooler also acts as a oil warmer & improves oil flow when the engine is cold. I would be reluctant to change out to an air cooling only system. By way of another example, the old 5 cylinder om617 Mercedes had an air type cooler. It also had a thermovalve in the system that bypassed the cooler when the oil was cold. Use some grease on Orings as a glue. I wonder if there is an "angled PITA clamp". Would help a lot. Hard bolts reqire long levers and a hand feeling nearly breaking bolts. I don't think it's possible to drill out broken bolt if the engine is in place.